Soon, in the next couple posts, I will reach the number 400 in the total number of posts I have made here since starting this blog in March of 2010. A lot of water has passed under the bridge in the last five years, and I have had some difficulties, actually longer than five years if you consider this coming February 22 will mark eight years since the beloved mother of my daughters passed away from pancreatic cancer, but nonetheless, life has been getting better for me. I am involved in an amazing relationship with a wonderful woman whom I’ve actually known for 43 years. Bearing down on eight months now, Mary is a fellow musician, great singer – she was formerly in a Heart cover band and also sang in another ’80’s Band, where they performed an entire set of Heart and another of Pat Benatar’s music. She also plays guitar and keyboards. She and I also share so many other mutual interests: good food, wine, Captain and Coke, Dirty Martinis, cooking, photography, good beer, she loves my fly tying and is fascinated by it, nature, dancing, she loves to fish, though I will be getting a fly rod in her hands for the first time when the weather warms a bit. It is just amazing and miraculous to find someone this late in life when one might have though the best has already passed by. My music career, hobby that was more or less given up in ’79 when I dropped out of the rock band I was in (back then we were just a rock band; the term Classic Rock had not yet been invented), has taken off as I’ve been drumming full-time in a Classic Rock Band called Pepper Street. We played fifty-seven gigs last year. It’s great fun, relieves stress, and I’ve met new friends and gotten reacquainted with old ones from back in the day. For not playing at all in thirty-four years, save for the occasional performance in church and a few theater musicals in the ’80’s, I had not played at all. Sadly, the drum kit was just collecting dust. I’ve since gotten my playing stamina back, and am getting my chops tuned as well. 😉 And doing some lead vocals, either from the drum kit or fronting the band when a friend who is also our soundman sits in. Such a blast! Don Bastian – at my vintage Premier 1975 Powerhouse PD2500 drum kit. 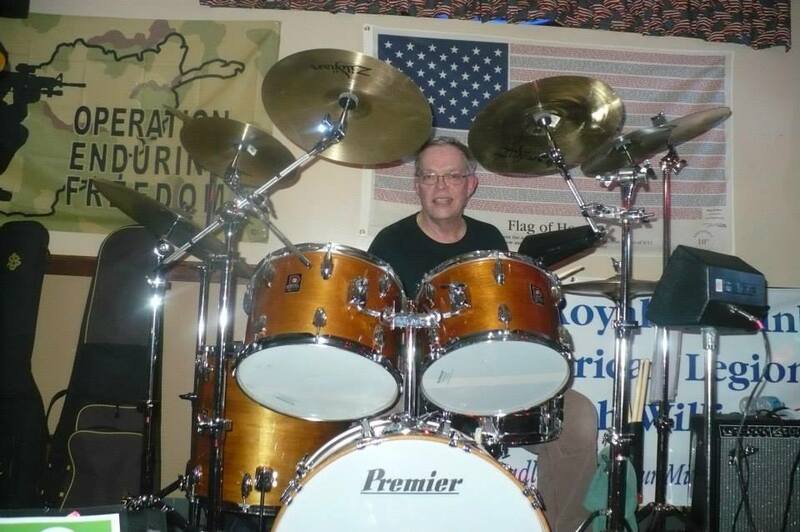 Taken on my birthday in April 2014 at a local American Legion Post. The hardware is all new, upgraded to the heavy-duty stuff from the last ten or so years. We play tonight. Another night of fun and music! 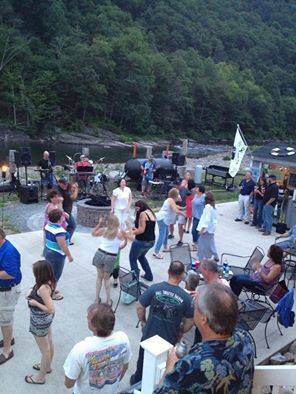 The Pepper Street Band performing July 2014 at the Tiki Bar and Patio at the Pier 87 Bar and Grill near Montoursville, PA. We have five bookings there again this summer. Pepper Street Band at the New Mountain Tavern, Allenwood, PA.
A highlight of the band’s gigs from last year: At Shade Mountain Winery and Vineyards, north of Middleburg on PA. RT. 104, and near Pennsylvania’s famed Penn’s Creek, at their Annual Fall Harvest Festival. There were more than 500 people present at this outdoor event in October. 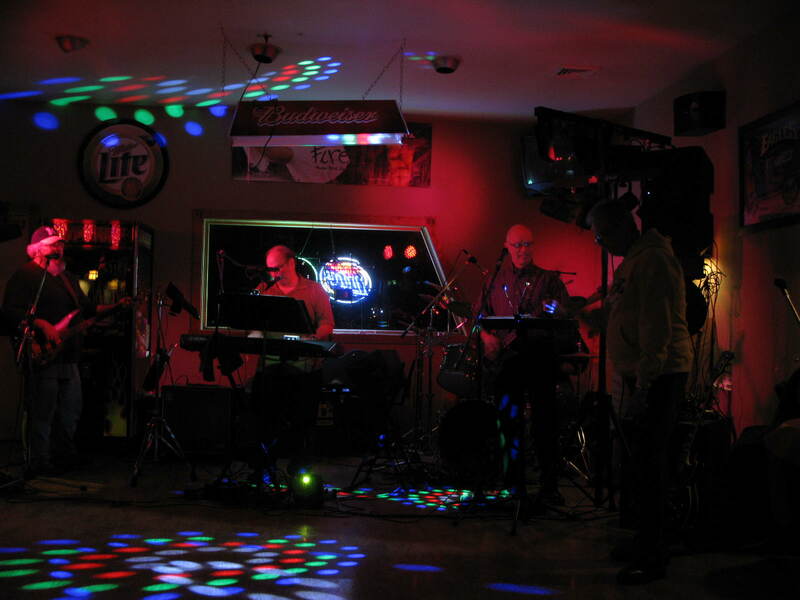 The band had a blast, the crowd loved us! 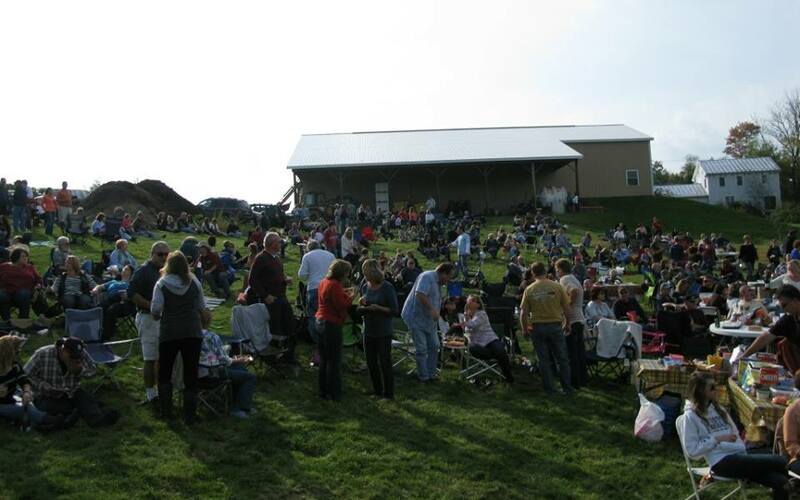 Crowd of 500-plus people at Shade Mountain Winery in October 2014, music by the Pepper Street Band, covering Classic Rock and Rock ‘n’ Roll Oldies. 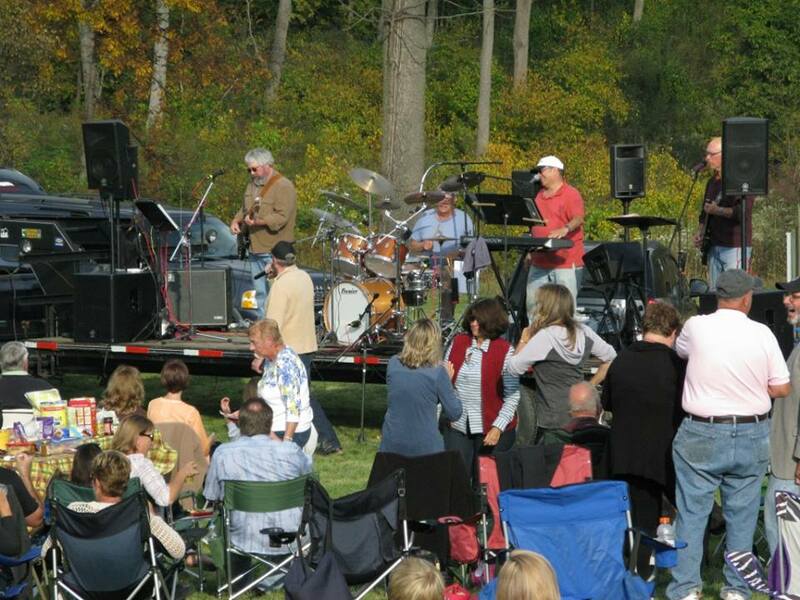 View of the Pepper Street Band, behind the stage at Shade Mountain Winery for their Annual Fall Harvest Festival, October 2014, near Middleburg, PA. Rock ‘n’ Roll! View toward the front of the stage at the Annual Fall Harvest Festival at Shade Mountain Winery, the Pepper Street Band is rockin’! More good news: We have been invited back for the Annual Fall Harvest Festival at Shade Mountain Winery on Saturday October 10th, 2015. Now that we are a few days into 2015, I figured I better get something on here. When a friend sent me this link on one of my original patterns – the title fly, or “RSP” as it is now called for short, I thought it would be great to highlight an excellent step-by-step tutorial posted on Fly Anglers On Line (FAOL). It was done by a fellow whose forum name is ScottP. He did a great job on this, so I figured I could post this here, and augment it with some pertinent fishing info. The RSP was created over twenty years ago, a brainstorm of mine to modify the famous Pickett Pin wet fly / streamer pattern. Hence the Red Squirrel Silver Body Picket Pin was born. Initially I tied the hackle palmer fashion as on the Pickett Pin, but I later dispensed with that for ease of tying, and the increased durability one achieves from a solidly lashed-in throat hackle. 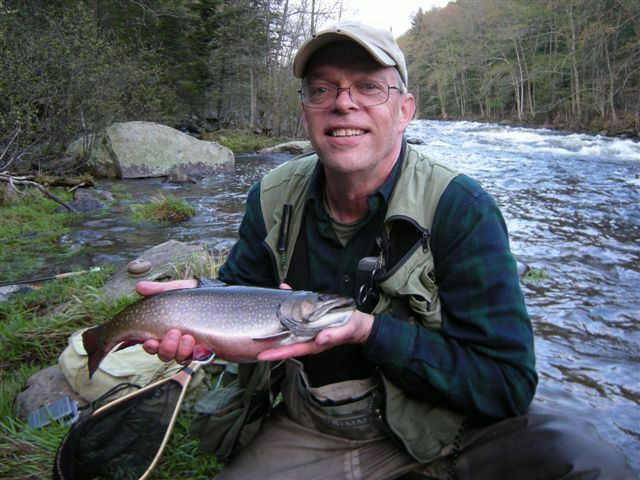 My brother, Larry, with a 17″ Magalloway River brook trout caught on the RSP. 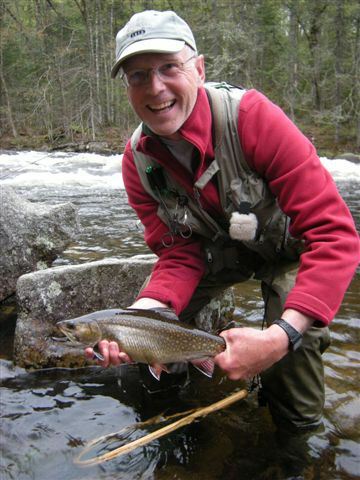 Don Bastian with a 17-1/2″ Magalloway River Brook trout caught on the RSP. 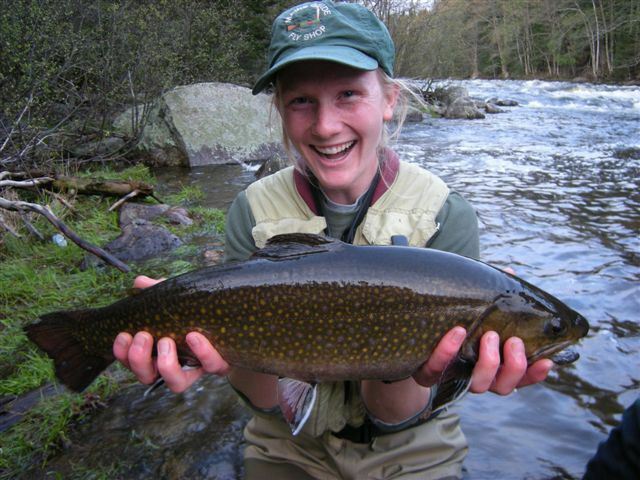 Emily Bastian with the biggest Magalloway River brook trout of our trip (of course!) – a 20-1/2″ female, caught on the RSP. Notice we are all smiles! Each of these trout was caught using a sink-tip line, 6 or 7 weight, and a Wooly Bugger in front of the RSP. Both flies are normally attached on 3x or 5# Maxima leader material, about 22″ to 24″ apart. The water was high. We spent a half-hour nymphing to no avail, prior to my decision to go with the bugger and RSP rig. When I did, I hooked up in five minutes. Emily at once changed her rig and took her trophy on the very first cast. Larry was also into a third large trout minutes later, but his got away when the hook pulled out. Next morning we returned and gave him the hotspot at the head of the pool. Then he lucked out and landed his big trout, too. He altered the tail by using pheasant fibers; I always use schlappen or hen fibers and generally always tie in a beard-style or false hackle throat. Thanks Scott for a great job and great photos on my pattern! The RSP – tied by Don Bastian. 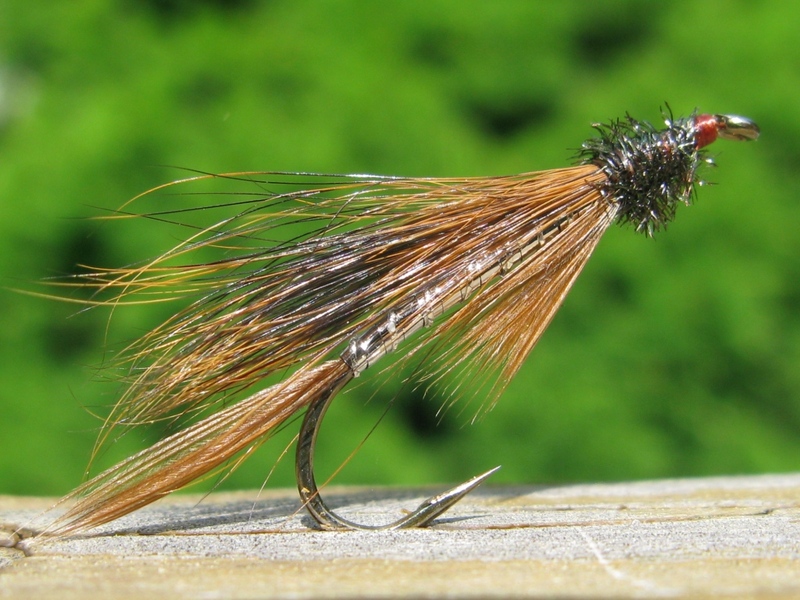 We almost always tie and fish this fly in a #8 or #10, 3x long shank hook. The wing is red squirrel. Scott posted that he used fox squirrel, which I have also done. They are both marked the same, but the red squirrel is shorter, making it better suited for the small sizes the RSP is normally tied in. 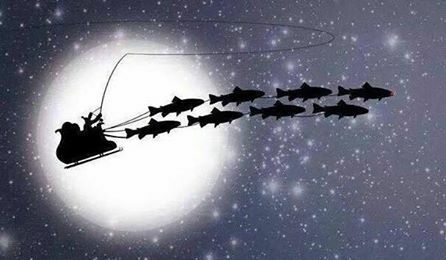 I have only question…where is Rudolph the Red-nosed Reintrout? It is with great sadness that I announce that Chris Helm passed away last night, after a several year battle with cancer. I learned of this sad news on facebook, from Steve Wascher, fellow fly tier and friend from western New York. 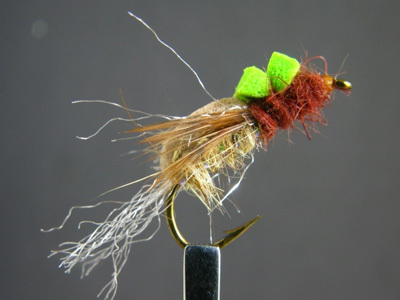 Chris operated his mail-order fly tying business, White Tail Fly Tieing Supplies, from his home. (yes, that’s how he spelled tying). Chris totally set up the contact, booking, and filming for my first DVD, which I will always remember, since it was recorded on my birthday, April 4, 2004. Chris did the introduction as well. 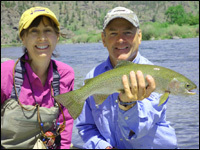 Then in 2007, when Kelly and Jim Watt of Bennett-Watt Entertainment were making a new, hi-def video series on DVD, “The New Hooked on Fly Tying,” Chris invited me to participate in that as well. They were filmed at his house. My advanced wet fly and streamer DVD’s were recorded in one day. A friend in Florida, and I saw this on facebook, drew this card, just this morning, as an expression of sympathy. 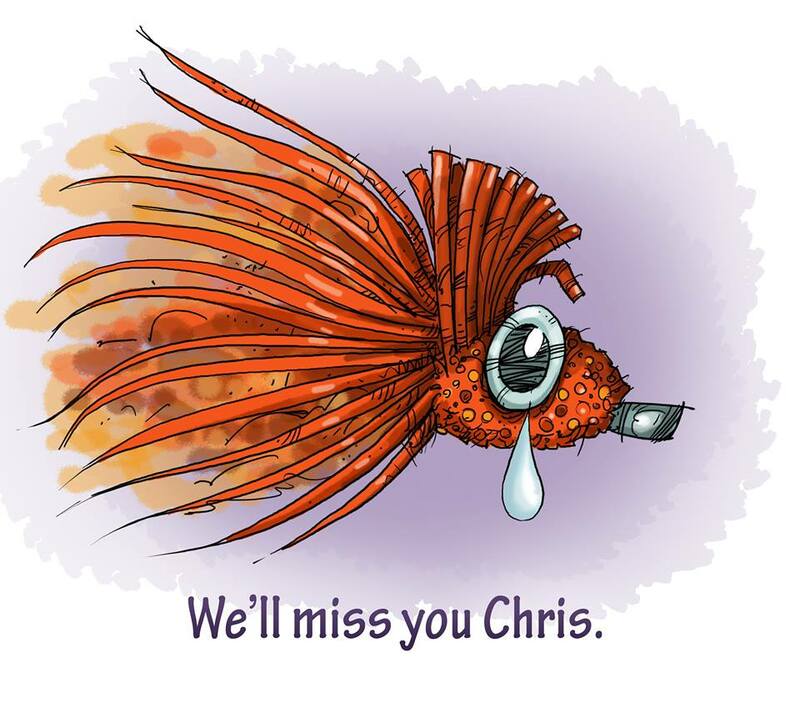 I believe since Chris was one of the foremost bass bug deer hair dressers in the entire country, that it is very fitting, and the artist, Joe Mahler, kindly granted me permission to share it with my readers. Thank you Joe, for your heartfelt expression of sympathy, combined with your talent. Well done.